Which way is Theresa May to turn? 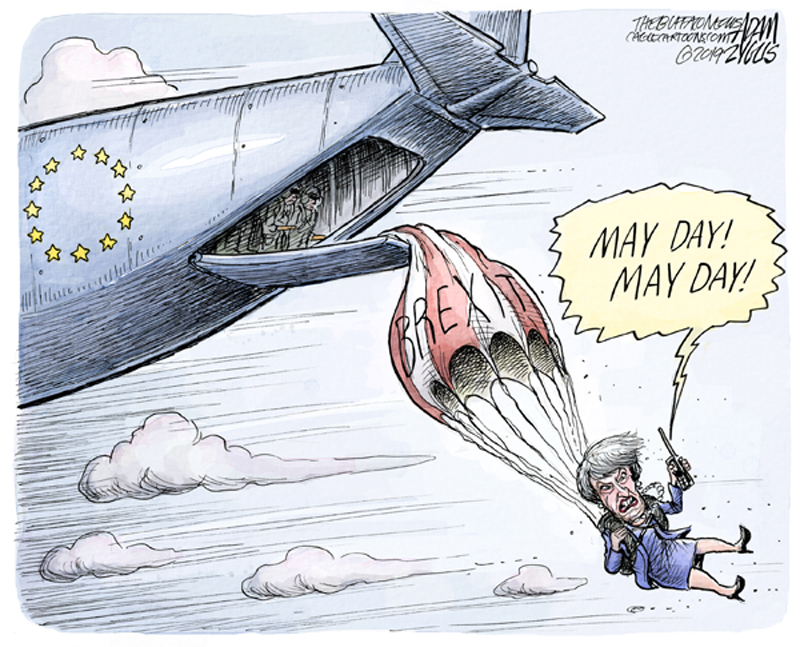 Every move she makes deepens the crisis, chaos and turmoil over Brexit. The postponed "meaningful vote" is due to take place on Tuesday, January 29, but apparently it is not to be so meaningful. Theresa May has set a number of "red lines", which she refers to as "principles", and which she refuses to set aside in order to seek a resolution of the crisis. Meanwhile, actual principles of working out a solution that favours the people are never considered, and May keeps repeating that because she allegedly is honouring the decision of the June 2016 referendum to leave the EU, the only choice is between "her" deal, "no deal", or no Brexit. Jeremy Corbyn for his part is manoeuvring within the situation, demanding that May take the option of "no deal" off the table, and refusing to meet with her until she does so. The experience of the SNP, Plaid Cymru and others who have responded to No.10 overtures, including leading trade union general secretaries such as Len McCluskey of Unite, and Dave Prentis of Unison, is that May's conception of negotiation is nothing but to demand that they fall in behind her deal. Her conception is to use their influence to attempt to get her deal, her Plan B (very similar to Plan A), to scrape through a Commons vote. As Corbyn and others have pointed out, Theresa May is in denial over the depth of the political impasse, over the wiggle-room that the EU leaders and negotiators are prepared to offer, and of the damage that the impasse and political chaos are inflicting on the polity. Not least in effect of this damage is the attempt to polarise the polity and divide it between Remainers and Brexiteers. Corbyn himself cogently pointed out in his Wakefield speech that the concrete conditions facing both Remainers and Brexiteers are the same, and are not to be sorted out through what amounts to a civil war between them. Indeed, Theresa May, despite her protestations of seeking "social cohesion", is stoking the flames of unrest. It is clear that May is also prepared to use the police powers to underline that the state must preserve itself against the people's rebuke of "Not In Our Name!". Neither does May see a General Election as a way out of the impasse, as she clings onto office, having had her fingers burned over the last time she was advised to go to the country. 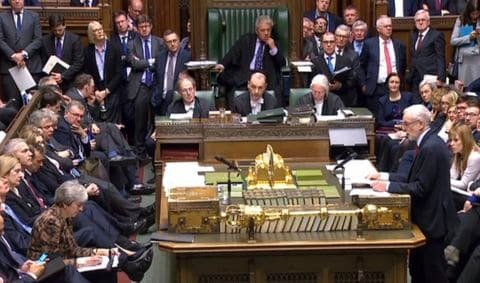 Jeremy Corbyn and the Labour Party he leads are using the tactics provided by the Fixed-term Parliament Act 2011, brought in under David Cameron, to maximise the possibility of an imminent General Election. Certainly the ruling elite do not see a General Election as favourable to them. It does seem at this time as though a General Election would bring a Labour government to power, or, if resulting in a hung parliament, would allow Labour to form alliances with other parties at present in opposition and hence form a government. Would this resolve the political crisis? Although naturally Jeremy Corbyn and his allies argue that it would then be plain sailing, he still has vested interests and the European Union bureaucrats to contend with. Corbyn has the advantage of having the social movements, of which he has been part, not only as political support, but as an important reservoir of activists and vote bank. But is this sufficient to ensure his policies of "For the Many, Not the Few" are implementable if a General Election is called and the Labour Party assumes the role of government? And what is this European Union? The EU itself is riven with crisis, not least the European project to make the EU a single political entity. To focus on the so-called "four freedoms", as though all the 28 EU member states subscribed to a united outlook, is misleading. This project went into crisis some time ago, not least because of the people's opposition to the neo-liberal agenda of the EU. And the prospect of a "social Europe" within the status quo is looking like a total illusion. It is partly the internal contradictions between the big powers of "Old Europe" themselves, partly the striving of these powers to dominate the other member states, and partly the movements of the people themselves against austerity, for their rights, and to demand a decisive say in the direction of society, that are besetting the EU with its own impasse. Meanwhile, the financial oligarchies demand to maraud wherever they wish, and the US seeks itself to dominate and dictate the agenda for Europe, which also is arousing resistance. Within this situation, what should be the outlook of the working class and people of Britain? We are of the opinion that the people cannot get caught in the trap of siding with one of the two warring factions, Leave and Remain, in the sense that there is a matter of principle at stake in siding with one or the other, when the working people themselves are not involved in setting the agenda of what it means - Leave or Remain - and their consequences. The ruling elite themselves cannot find a champion that convinces the people one way or another, or that favours the private interests that dominate economic and political life, let alone a course of action that favours the people. Furthermore, we reject any suggestion that the people are to blame for any aspect of this crisis, whether it is the face of xenophobia, racism or chauvinism that the ruling elite represent. This reaction is being imposed on the people. So within this situation, the working class and people must participate in working out themselves what favours their interests. In our opinion, the vantage point that we must adopt is one where it is grasped that the struggle in the real world is between the forces representing what is old and deeply reactionary, and those representing the new and a progressive future in which the interests of the people are firmly put at the centre. It can be seen that the way the battle of Brexit is being fought out, causing deep rifts in the polity, starving the people of information as to what is at stake and creating diversionary categories so that the people are prevented from having their own outlook, is blocking the people from taking the stand: A plague on both houses of the ruling elite! Let us take a stand for our own interests! In our view, this is what Brexit is calling on us, the working people, to do. We should fight for the New. In the face of the all-round crisis, we should organise for the alternative. What this means is to recognise how Parliament has become completely dysfunctional, not even recognising what its own norms are and certainly not capable of sorting out a way out of the impasse, and instead to take a stand in defence of the rights of all. It is to take a stand in favour of the people's empowerment. 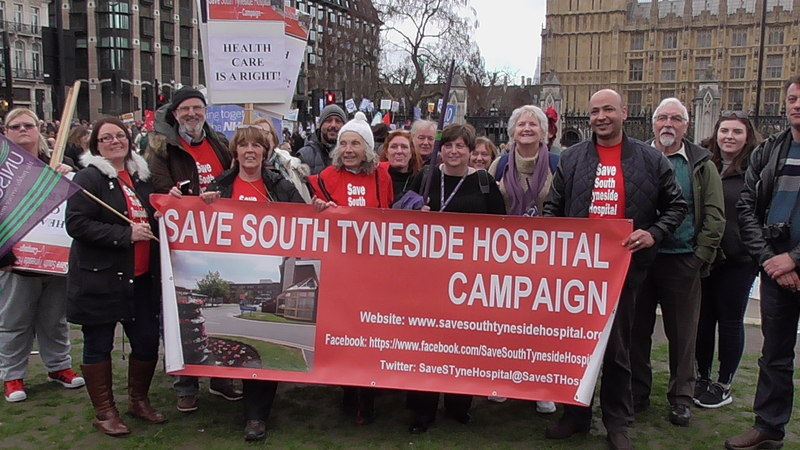 As we go into 2019, the Save South Tyneside Hospital Campaign (SSTHC) would like to congratulate the people of South Tyneside, staff and clinicians at the hospital who have and are continuing to oppose the downgrading of our vital acute health services at our District General Hospital. So far, this fight to save our services has focused on the high-performing vital Children's 24-hour A&E, one of the best full maternity services and Special Care Baby Units and for the restoration of stroke rehabilitation services at the hospital. 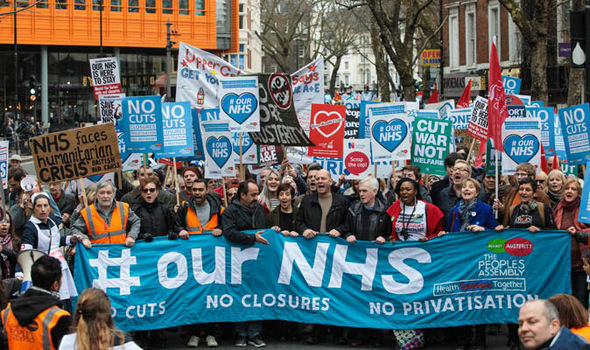 These services are being downgraded as part of government's plan for the NHS in England. We noted that it was very significant that on Monday, January 7, Theresa May revealed in her government's statement the long-term transformation plans for the NHS dressed up as "more funding". She had asked the NHS to draw up a long-term plan, one that is "clinically led and locally supported" with an "absolute focus on cutting waste". Her statement shows that the focus of the NHS plan is not more funding for existing vital services but is more about ruthless cuts to existing NHS acute and community services with a "long-term plan" of a digitalised NHS and bed-less Emergency departments, where people are expected to fend for themselves in their own homes. Our experience of fighting against this so-called "path to excellence" and to save our hospital services shows that this is a path that certainly hasn't got "local support" as Theresa May claims, because people know it is jeopardising vital acute services that they need to have access to at their District Hospitals. 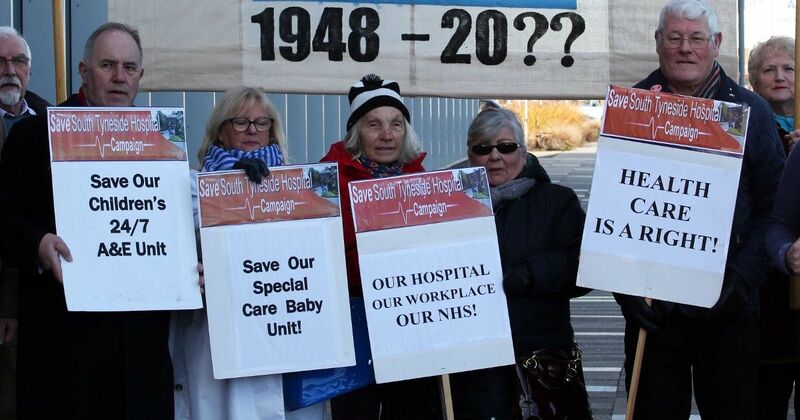 Over the last two years, not only has the SSTHC launched its petition which now stands at 40,000 against the direction of this plan, but the people have held five mass demonstrations and three large public meetings in South Tyneside. Last May, the matter was referred to the Secretary of State by the Joint South Tyneside and Sunderland Council Scrutiny Committee because they challenged the validity of consultation and said the plans were not in the best interests of the people of South Tyneside. This referral was unsurprisingly rejected by a government that is initiating these plans. Following that, the SSTHC in December 2018 took the case challenging the unlawful nature of the consultation to a High Court Judicial Review in Leeds, funded by local people of South Tyneside and Sunderland. So far, our legal challenge was unsuccessful, but the government and Theresa May and NHS England cannot pretend that the public are behind the so-called "path to excellence". At this time, the SSTHC is considering its options to continue the fight to save our hospital services. When we receive the full judgement of the Judicial Review on the Phase 1 consultation, we will consider it along with our legal team and we have not ruled out an appeal. We are also considering what now needs to be done so that the people of South Tyneside can make their claim to decide the future of their local hospital services. In order to oppose further downgrading of services in the next Phase we have also given our evidence to the South Tyneside and Sunderland CCG "Listening panel" and have given our views on the evaluation criteria to them in evaluating our services. These views are on our website. We will continue to provide further information on the progress of our campaign as the year unfolds. 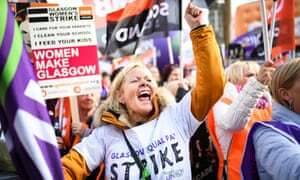 The mammoth struggle of the female workers of Glasgow City Council over pay inequality has reached a successful conclusion, with thousands of women to receive pay-outs that could total more than £500m. 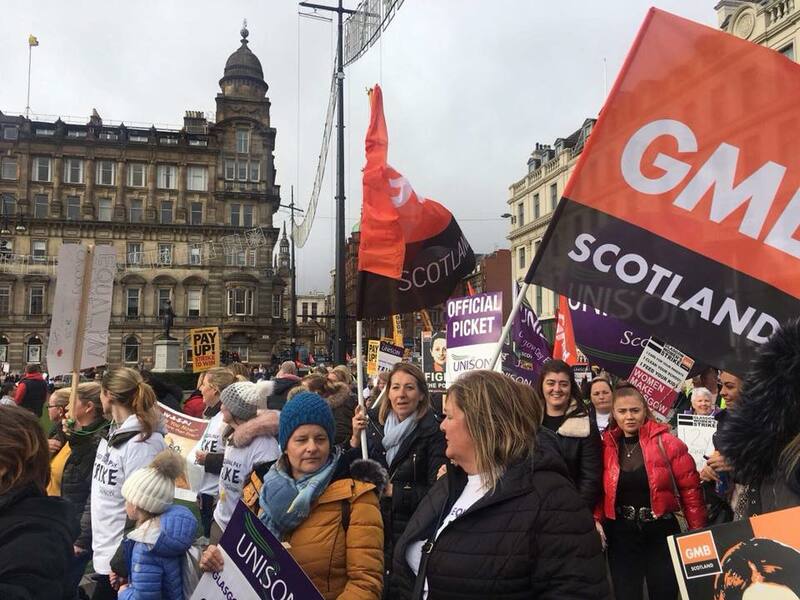 The council and the equal pay claimant group, represented by Action4Equality Scotland, and Unison, GMB and Unite, announced earlier this month that they have reached an agreement in principle to settle the thousands of pay claims. Such an outcome is significant in a time when arbitrariness and imposition is increasingly the norm. The struggle is also significant for its scale. A strike held in October last year was the culmination of a twelve-year fight of these women in defence of their rights. Over 8,000 women struck work and 12,000 demonstrated in the streets in what was the biggest such strike over equal pay in British history. It therefore stands amongst the historic democratic successes of the workers' and women's movements, from the era of Red Clydeside a century ago to the Ford workers' strike in the 1960s. It has been a long drawn-out battle that has taken many complicated turns, in the course of which some 14,000 separate claims have been brought to the courts! It began in 2006 with the introduction of a new evaluation-based pay scheme, a result of the council's own workforce pay and benefit review. The scheme had been introduced with the stated intention of dealing with the issue of pay inequality between women and men. However, such is the irrationalism that the scheme was turned into its opposite. In practice, the scheme was set up such that it those on split shifts and irregular hours were paid less. This particularly affected those employed in homecare, cleaning, catering, schools and nurseries, which are female-dominated sectors, as opposed to those in predominantly male sectors such as waste collection. Rather than solving any problems, these arrangements entrenched inequality, and in May 2017 the pay review was ruled to have discriminated against women by the Court of Session. Even when the administration of the council changed, words did not become deeds as promises to settle claims lay unfulfilled. In conditions of arbitrary authority, so-called negotiations on issues of pay and conditions have typically become sham exercises and a form of imposition. Such was the experience of the women, who accused the council of a lack of meaningful engagement. Regardless, the council workers were having nothing of it and fought to defend their interests. Leading up to October's strike, Unison regional organiser Mandy McDowall said: "It is a modern-day scandal that nearly 50 years on from the Equal Pay Act being introduced, we find ourselves standing alongside thousands of women who are being discriminated against by one of the UK's largest councils." 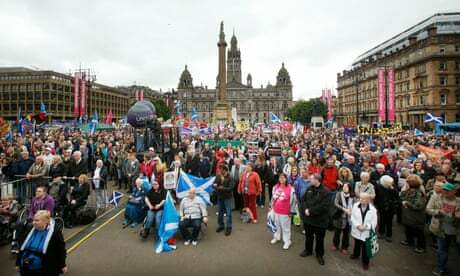 "These women are the lifeblood of Glasgow," she added. 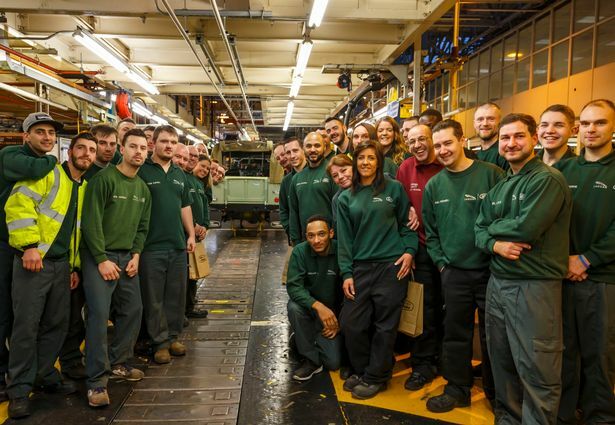 "They carry out vital roles across the city - cleaning, caring, educating and looking after some of the most vulnerable people in our society. They are the cogs that keep our city turning, yet their roles remain chronically undervalued." "Strike action isn't a decision these women have taken lightly, but after months of empty promises they have been left with no choice," she said. The action and broad mobilisation proved crucial in this success. 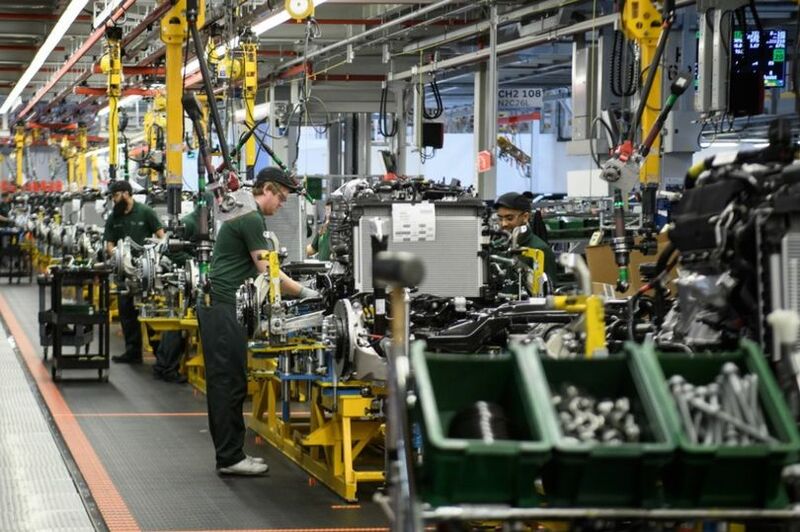 Action4Equality's Stefan Cross said that it is since the strike that "there have been real and constructive negotiations", and GMB organiser Rhea Wolfson said: "This has been hard won and wouldn't have happened if the claimants hadn't taken decisive action last October. The strike succeeded in its aim of making the council take these claims seriously. It was also a spectacular event that put equal pay for low-paid women on the national agenda." We congratulate the women workers of Glasgow on their victory.